Medium: original etching. Executed by Daubigny in 1859 and published in Paris by the Gazette des Beaux-Arts; this impression on chine-colle paper was printed by Delatre. Size: 4 1/2 x 7 1/4 inches (image). Signed in the plate (not hand-signed). Condition: there is foxing (mostly to the margins). 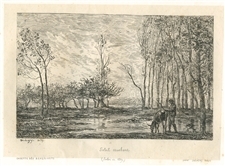 Charles Daubigny etching "Bords de l'Oise"
Medium: etching. From the rare 1897 portfolio "Art et Nature" by Leon Roger-Miles, published in Paris by Boudet in an edition of 525. Printed on Marais wove paper, the image size is 4 3/4 x 7 3/4 inches (120 x 196 mm). Signed in the plate, not by hand. 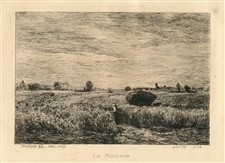 Charles Daubigny etching "La Moisson"
Medium: etching. Etched by Karl Daubigny after Charles Daubigny. Although not as famous as his father, Karl Daubigny (1846-1886) was considered a talented artist in his own right. Printed on laid paper and published in Paris in 1875 for a rare volume by By Frederic Henriet. The image measures 4 x 5 5/8 inches (101 x 150 mm). Signed in the plate, not by hand. Charles Daubigny etching "Le Village pres Bonnieres"
Medium: etching. Etched by Karl Daubigny after Charles Daubigny. Although not as famous as his father, Karl Daubigny (1846-1886) was considered a talented artist in his own right. Printed on laid paper and published in Paris in 1875 for a rare volume by By Frederic Henriet. The image measures 4 x 7 1/2 inches (103 x 191 mm). Signed in the plate, not by hand. Condition: a bit of foxing in the margin. Medium: etching. 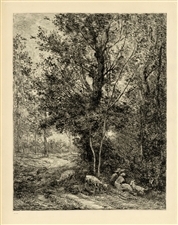 Etched by A. Brunet Debaines after Barbizon artist Daubigny. This impression on cream laid paper was published in Paris by L'Art ca. 1880. The image measures 5 1/4 x 8 3/4 inches (135 x 223mm). Signed in the plate, not by hand.